What is macular pigment and why is it important for our vision? The macula or macula lutea (“yellow spot” in Latin) is an oval yellow area near the center of the retina of the human eye. At the center of the macula is the fovea; with the highest concentration of cone cells (photo-receptor cells) in the retina and is responsible for our detailed central vision. Central vision can be defined as your vision when reading a book or when looking directly at an object or someone’s face. It allows you to discern fine details, contrast and color. The macula is shielded by an important and naturally occurring protective substance known as the macular pigment (MP). MP comes entirely from dietary origin, and is made of three carotenoids called lutein, zeaxanthin and meso-zeaxanthin (L, Z & MZ). These three carotenoids are found in equal amounts at the macula, (shown below in the bulls-eye pattern below) with MZ being the dominant carotenoid at the epicenter of the macula (fovea) where our vision is sharpest. It is no accident that nature has taken the trouble to give humans the ability to accumulate these three dietary compounds at the very center of the retina, where vision is sharpest, where color vision is processed, and where oxidative stress is maximum. Macular pigment limits oxidative injury at the retina by limiting the amount of short wavelength (blue) visible light incident upon the photoreceptors (irradiation with short wavelength light is known to promote free radical production), and also because its constituent carotenoids are effective scavengers of free radicals (i.e. antioxidants, just like vitamin C). 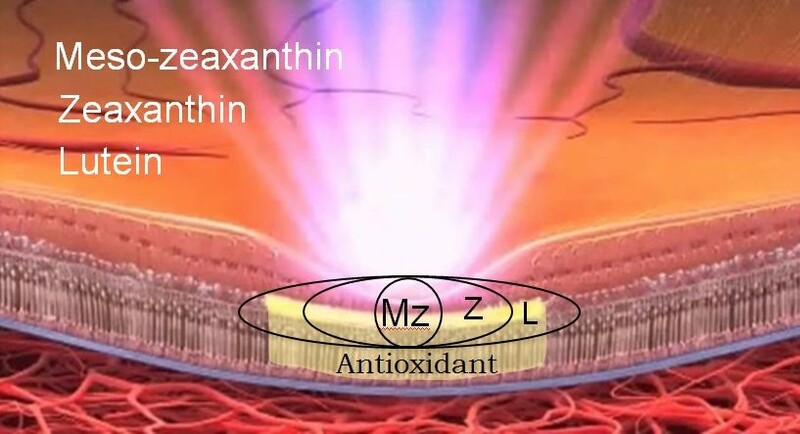 However, it is important to realize that the collective antioxidant effect of the macular carotenoids is maximized when they (L, Z and MZ) are taken together in a supplement.